The problem I’ve faced most during camping is charging my phone and other electronic devices. Only a good quality solar panel can be the source of energy in these cases. They turn sunlight to electricity. Nowadays, new technology makes solar panels more flexible, comfortable, affordable and better performing than before. By using them you’ll be able to give power to your devices with the power of sunlight without electricity. Moreover, you can meet your purpose without causing any harm to the environment. This is the reason I love them. You will find many models with great features available in the market which will make you a little bit confused to choose one. To give you a clear idea and save your time, I’ve shortlisted top 10 of them and the basic characteristics of a good quality solar panel. You can easily pick the one that meets your needs among them. The Go Power! GP-PSK-120 portable solar kit is a great device for solar charging. It’s available in 2 models- 80watt & 120 watt. This device is foldable. 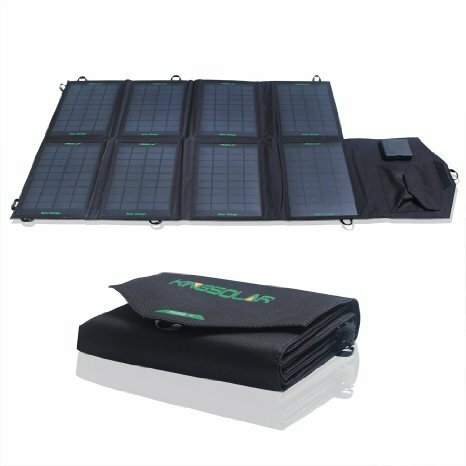 This foldable solar panel is perfect for those types of people who do not want mount a solar charger panel to their rooftop permanently because it offers some best offers like versatile & convenient battery charging option. You can put it in the shade while you device sits in the sun to recharge your batteries. The amazing Anderson-style charging feature connector let you interchange the charging accessory quickly that suite according to your needs. It allows maintaining trailer battery or RV while on the way to charge your ATV, car or boat battery. The Go Power! 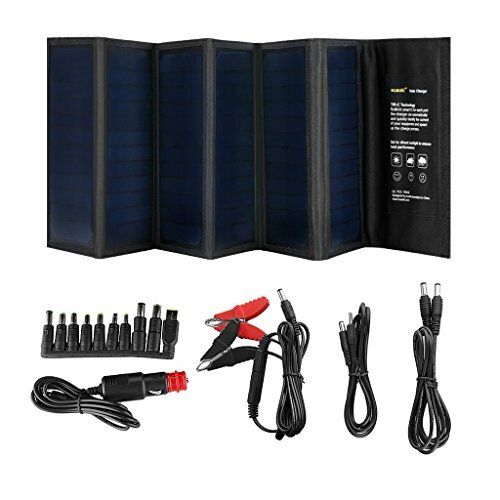 portable solar kit comes with a quick charging option with the capability of various types of battery charging options. Battery clamps & includes carrying case. 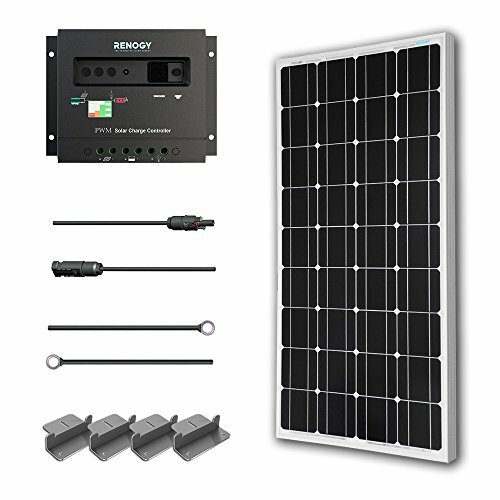 Renogy 100 watts 12V Monocrystalline solar starter kit is designed for that kind of people specifically who are new to this solar. 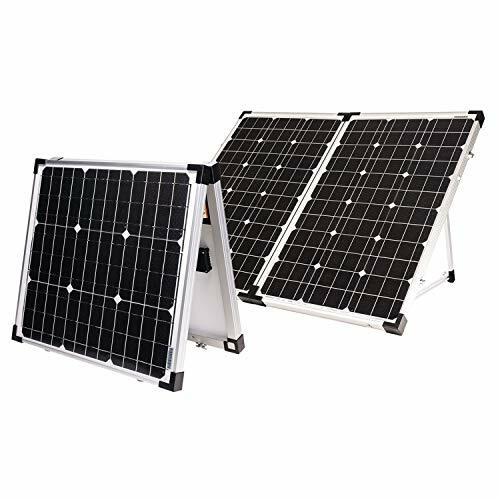 This kit comes with new system of necessity such as 100 watts 12V Monocrystalline solar panel, 20 feet 10AWG MC4 adapter, 8 feet 10 AWG tray cable, Z-brackets set & 30A charge controller. This is great for RVs, boats, sheds, trailers etc. it provide many benefits as like grid independence and quiet power production. The negative grounding controller ensures you the safety and broader off grid applications especially for vehicles which one has battery negative on the chassis. It also prevents system failure. This Renogy solar panel kit can extend your travels further than ever before. This is an EL tested device, so you won’t be worried about heating experience. It has high solar cell efficiency of Monocrystalline and Polycrystalline. The bypass diodes reduce power drop cause in low light environments. It is a long lasting product with IP65 Ratting. This item is sealed, flooded charging algorithm ready. It also ensures you a safe system what is equipped with multiple electronic protections such as overload, overheating, short-circuit & reserved polarity. This solar panel is expendable. With your Renogy wanderer 30A PWM, you can extend up your system up to 400 Watts. EL tested solar kit that gives no hotspot heating experience. Less power of watts than similar product. The Suaoki 40W Portable sun power Mono crystalline solar panel with DC 18V and USB 5V can output charger for laptop tablet SLR GPS cell phone other 5-18V devices. It has dual port output so can you can charge 2 devices at the same time; one is DC output (up to 18V) and one is USB output. It is also versatile & ultra portable so you can charge your mobile or laptop devices as well as your car and storage battery by using the DC port which is included with the set by the sunlight. Suaoki’s intelligent chip (TIR-C technology) provides built-in smart IC for the USB port charger that can quickly & automatically identify the current of your equipment and can speed up device’s charge progress. It charges the storage battery without overloading or overheating the devices by using the clamp. You can also use the solar panel near the swimming pool or on the beach with our fear because it has a water proof layer that let you t charge your device without getting wet. This is perfect for outdoor activities like boating, hiking or travelling because of its paper sized and bag shaped folding feature. Suaoki’s solar panel is truly a great assistant to keep you out from many of complicated situations with the unlimited and clean power from the sunlight with up to 25% efficiency. It includes 40W foldable dual port solar charger bag, car charger, clamp, required cables etc. 1 DC to SAE and 2 DC to DC cables. Less power of 40 watts than similar product. The [High Efficiency] 50W Solar Charger, PowerAdd 18V 12V Foldable Solar Panel can charge cell phone, laptop, generator, powerhouse, charger center, UPS and more. This poweradd foldable solar panel has 2 major breakthroughs. Its highly transformation efficiency is up to 22% where other similar product has 15% or lower. It has a beautiful unique design with voltage regulator that ensures stability. So your devices will get a stable charging though the input becomes unstable. This device has feature to charge multiple device at a time. The 5V USB charging port is suitable for smart phones, tablets, iPads, iPods, external battery pack etc. on the other hand, the 18V DC port can be used for laptops, car batteries or other DC powered devices. This solar kit has a safety protection. This device is RoHS, CE and FCC certified with built in safeguard protection. It can deliver its fastest possible current up to 5V/2.7A and 18V/2.1A under direct sunlight. This pack includes many kinds of features and equipments. Has a good safety protection. Build material should be more premium. The KINGSOLAR 28W foldable portable solar charger has dual charging output. They are USB 5V& DC 18V Output. This solar power charger is suitable for hiking, camping, travelling etc. it’s compatible with smart phones, laptops, tablets and all 5V USB & 18V DC charging Devices. The efficiency of this solar panel is up to 18.5% that’s better that other similar product. It has intelligent power supply ability. Its unique designed voltage regulator ensures current ability to protect devices while charging. It has Mono solar cell, PET, EVA and TPT premium material and circuitry which ensure lifetime reliability. It is a compact light folding design with 8 solar panels which helps you to use freely. This device is highly environment friendly. You can enjoy easy charging facility anywhere with its unlimited clean and free solar power. Can be damage it electric circuit in water condition. Batteries could be much better. 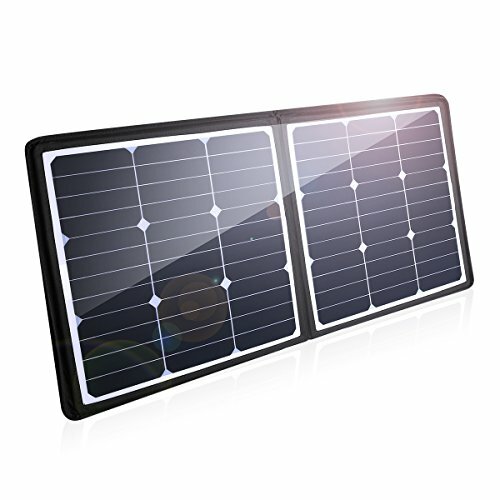 You’ll find mainly two types of portable solar panels in the market. These panels are made of plastic or laminate and only bend around 30-degree angle. 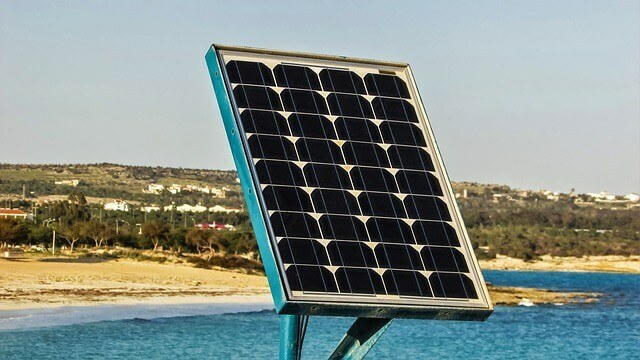 You can install or uninstall and transfer this type of solar panel with the surface between caravans, boats, RV's and other locations. You can easily pack or unpack foldable solar panels and carry them in the backpack for hiking or other adventurous activities. Solar energy allows us to use energy that is available around us and let us live a clean, healthy and environment- friendly lifestyle. But you may wonder about the working process of the solar panels! Solar panels are composed of many tiny cells and they are can absorb sunlight. They are known as photovoltaic cells. These cells can convert the energy they absorb from sun to useable energy for solar panels. In short, they absorb photons & generate electricity for us to run electric appliances and devices. Photovoltaic cells are made of 2 pieces of semi conductive material which gives the opposite charges and create electric field, which helps the solar panel to do this. Whenever solar panels consume photons, they get ready to produce electrons. And these electrons are gathered at both ends of the cells and transferred to the solar panel by a wire. So this is the process that creates solar energy with the help of a solar panels. Before buying a portable solar panel, you must consider some basic features. Must select the model with better performance that includes the charging time. Solar panel with high wattage can be charged completely within a very short time. Output power is another worthy feature to look for. The panel with an amazing output power takes a short time to recharge it. Must check the type of connections you’ll get from the model and pick the one which allows you to connect easily with different types of devices. Buying a model that is compact, lightweight and easy to use will be more effective. You’ll find different types of accessories depending on various models. Some come with extension cables, charging indicator, adapters and more. It is better to have the one which will perform best and accessories can enhance its performance. Some models can be the combination of a flashlight, charger and solar panel, these will be great for different types of applications. Pick the one that delivers you the best functionalities you need. Finally, all the models I’ve described above are the best models available in the market. They can be the great support for you while enjoying hiking, camping or other outdoor activities. Just take time, compare the models, keep in mind the features mentioned above and pick the one that matches your requirement. A good quality portable solar panel can make your trip smooth and comfortable and also helps you to reduce bills at home. You will be able to power up your appliances without impacting on the environment. So pick the one you need and enjoy!